The changing economic and demographic patterns of the United States have many measurements; few of them, however, are more comprehensive than the new circulation realities of the press. 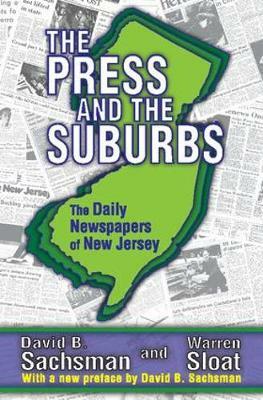 This volume tells the story of the twenty-six daily newspapers of New Jersey from the 1960s to the 1980s and in so doing tells the story of the rise of suburbia and the golden age of suburban journalism. In an intense effort to keep pace with the changing location of their readers-and most particularly with the upscale consumers-the shift to the suburbs was marked by changes in news coverage, advertising, and promotion. Though people have predicted the decline of newspaper business for more than fifty years, they were proven wrong by the rise of the suburban press and by the survival of most newspapers, urban and suburban alike, through the 1980s and 1990s. But in the twenty-first century, the news and information industry has changed, and the national and international economy has faltered. In his new preface, David Sachsman takes the reader on a tour of what happened to each of the New Jersey daily newspapers since the publication of the original. The twenty-six newspapers studied have dwindled to sixteen, and huge losses in circulation have caused drastic cutbacks and mergers. The decline in New Jersey newspaper readership is part of a national trend. This is an essential book for all American historians, journalists, and communication specialists.